Finely chop the walnuts and apricots. Combine the dried fruit, walnuts and honey to form a moderately thick paste. 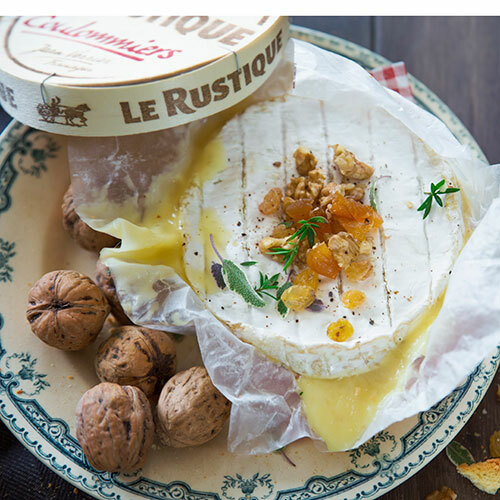 Remove the camembert from its wrapper, slice the cheese in half horizontally and garnish with dried fruit paste. Wrap the cheese in its original wrapper and return it to its wooden container. Cover with lid and wrap everything with aluminium foil. Place the Camembert on the barbeque and close the lid. Bake for about ten minutes. While the Camembert is baking, toast the slices of bread. Remove the aluminium foil and the lid. The camembert should be warm and runny. Serve immediately with toasted slices of baguette.